Sanitation in Foodservice Book from C.H.I.P.S. 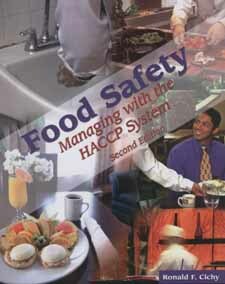 This textbook presents the Hazard Analysis Critical Control Point (HACCP) method of food safety in a systematic, understandable format. Clearly defined terms, detailed lists of food safety responsibilities, and checklists for all control points make this a resource that can be readily put into practice in any food and beverage operation. Because it refrains from direct reference to U.S. government regulations, this textbook is highly accessible to international readers.